There’s no doubt that riding ﻿a motorcycle is fun and exciting, especially when you’re cruising down a highway. Therefore, there is a growing number of motorcycle riders around the world. Another major factor why people purchase bikes is because of its ease of maintenance. There are several tools that would help you maintain your bike and one of them is a motorcycle jack. In this article, we will be discussing everything you need to know about this helpful tool. To add, we have provided you with a list of our top 5 picks for the best motorcycle jacks out on the market, as well as each of their pros and cons. With so many brands to choose from, how do you pick the right one? Worry not because we are here to help you. Read on if you want to know more. What Is a Motorcycle Jack and Why Is It Important? What Are the Factors to Consider When Choosing a Motorcycle Jack? A motorcycle jack is an equipment that you can use to elevate your motorcycle from its resting height to a lifted or upraised position. This tool can be used either with hydraulics or compressed air and sometimes, a combination of these two. You will find later in this post that there are also several types of jacks designed to accommodate specific repairs, weight, and types of bikes. Motorcycle jacks also come in different forms. Some can be maneuvered easily with their attached wheels while others are already fixed in their position. However, modern versions of motorcycle jacks now come with a wheeled base, a flat platform that can move up and down, and lastly, a hydraulic system that you can use with a hand-powered lever. A motorcycle jack can be very useful especially if you are performing regular maintenance on your bike. It is used to service, repair, and store almost every type of motorcycle. If you have one in your garage, you will find that it will be a lot easier for you to work on and maintain your motorcycle. Some, however, have wheels that allow you to store your bike easily in the garage. You might have wondered why a lot of riders prefer to service their own bikes. The answer is very simple. You can save a lot of money if you do this task on your own. You would not have to pay a mechanic if you need to get the job done on your bike. To add, it does not matter whether you are just a beginner or an expert; getting a motorcycle jack is a must for every motorcycle rider. Choosing the right motorcycle jack for you can be very challenging, especially because there are several great models to choose from. In this section, we are going to discuss some of the most significant factors that you need to watch out for when selecting the best motorcycle jack. Hopefully, we will shed some light to help you make an intelligent buying decision. As with any other equipment or tool, ease of use is a very important factor to consider. Like all the other items that you may have in your garage, a motorcycle jack should be straightforward and easy to operate. In addition, make sure that the manufacturer provides detailed instructions on how you can make the most out of it. When choosing a motorcycle jack, you should check whether it operates on a hydraulic system and if it has a foot-operated pedal. With these features, you only need to exert pressure on your foot to elevate your motorcycle to the target height. Mishaps can happen while you are repairing your motorcycle. Improper use of this tool can cause serious injuries or worse, death. It is very important that you pay attention to the jack’s safety features, as it will give you peace of mind. When choosing, it must be stable on the surface and make sure there are secured straps that will keep your bike in its place. You may choose between these two types of motorcycle jacks: hydraulic and scissor. A hydraulic motorcycle jack, proven to be a more popular choice because of its ease of use, can be operated using a foot pedal. On the other hand, a scissor motorcycle jack comes with a crisscross pattern, which supports the top when lifted. When selecting a motorcycle jack, make sure that you also consider the size of the room where you will place it. To add, you must measure your bike to know if it’s the right fit. Lastly, check the weight of your motorcycle, make sure that it is within the range of the jack’s weight capacity. Most of them range from 1,000 pounds to 2,000 pounds. As with any other product, a motorcycle jack’s construction is another important factor to consider. Make sure that it is made of durable materials, which may vary from aluminum to steel. In addition, make sure it is lightweight, so it will be easy for you to move it around your garage. Lastly, it must be strong enough for you to make the most out of it for a long time. Be wary of the motorcycle jack’s price, as the price does not necessarily equate with its quality. One way to address this is to check the features that you will most benefit from and relate it to the price. It is highly recommended that you choose one that offers at least a year of warranty. With this, you can return the product when it comes defective if it’s still within the warranty period. The Black Widow motorcycle jack is very easy to use and lets you accurately adjust it to your desired height. It can also be screwed onto the floor of your workshop or garage due to the holed base, as well as 2 pre-drilled brackets on the base of each side. This design significantly enhances the stability while allowing you to lift even the heaviest motorcycles. Another great feature of the Black Widow motorcycle jack is that it has a slip-resistant platform, big enough to store big motorcycles such as touring motorbikes or choppers. It also comes with removable frame adapters that have rubberized pads. With this, you can lift your bike without accidental scratches. While it only weighs 28 pounds, it has the capability to raise a motorcycle of up to 1,100 pounds. It’s lifting range is from 3.75 inches to 16.25 inches, allowing you to access hard to reach areas of your bike, especially during replacement or repair. To add, its frame adapters allow you to lift your bike for up to 19.5 inches. While the weight capacity is limited to only 1,100 pounds of motorcycle weight, the Black Widow motorcycle jack still is a great bang for your buck due to its several features including its non-slip platform and removable frame adapters. When maintaining or repairing a heavy bike, it is a requirement that your chosen motorcycle jack is able to handle the pressure and is strong and sturdy enough. This is where Milestone Tools’ PowerZone 380047 motorcycle jack can come in handy, with its 1,700-pound weight capacity. It is also a very powerful equipment trusted by professionals. When retracted, this motorcycle jack measures 4.5 inches tall and has the capability to be raised up to 14.5 inches in height. Now, that’s a lot of workspace available for you if you need to get under your motorcycle. Another great feature of this motorcycle jack is that it has a food-activated hydraulic pump, which would mean that using this tool will be certainly hands-free. It is also equipped with a multi-positional safety lock that improves security and safety. In addition, its lifting pad is rubberized, which prevents your bike from incurring any unwanted damages. The PowerZone Hydraulic motorcycle jack, with its impressive 1,700-pound weight capacity, has also been proven to be valuable to a lot of consumers because of its ease of use and its durable construction. The Extreme Max motorcycle jack is one of the most reliable scissor jacks in terms of stability, strength, and durability. It can withstand varying temperatures and harsh weather conditions. It also has the capacity to lift 1,100 pounds of motorcycle weight. To add, its lifting range is from 3.37 inches up to 14 inches tall. As with similar products on this list, the Extreme Max motorcycle jack boasts with its 1,100-pound weight capacity, durable construction, and lifting range of up to 14 inches. Another great scissor jack on this list is the Dragway Tool motorcycle jack, equipped with a wide and stable platform that measures 16x10 inches, suitable for any surface to work on including concrete and sand. It can lift bikes of up to 1,100 pounds and lifting range is up to 13.25 inches. It also comes with rubberized pads, making it non-slippery and safe to use. While you may encounter difficulty in finding replacement parts for this model, it still is a great buy because of its features including rubberized pads and its ease of use. The APlusLift motorcycle lift is another great choice, as it features a stable scissor frame that also comes with precise pivot shafts and durable gauge steel. To add, it has a strong and durable paint, that will be able to withstand extreme weather conditions. Lastly, it can accommodate up to 1,500 pounds of motorcycle weight. Even though some find it too narrow on the sides, probably the best takeaway from the APlusLift motorcycle jack is the brand’s 2-year warranty on parts. With this, you can always return it to the manufacturer in case it becomes defective within the warranty period. More and more motorcycle enthusiasts are now realizing the importance of having a motorcycle jack in their garage because of its benefits, especially during maintenance and repair. 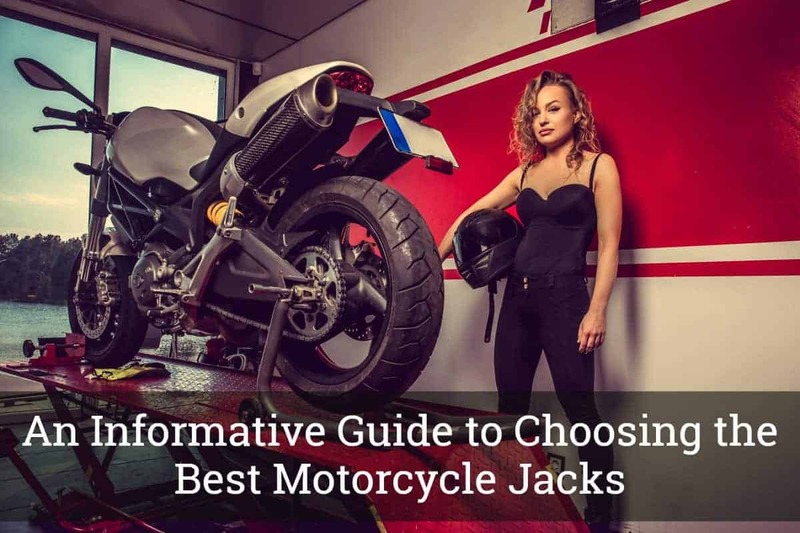 With this, we have provided you with everything there is to know about choosing the best motorcycle jack and we hope that you can now make an intelligent buying decision.